This add-on is integrated with the Semaphore SMS service provider. This add-on automatically sends SMS notifications to vendors in case the orders status changes. For example, order placed, order processing, order cancellation and etc. Instant SMS notifications serve to process the purchase orders faster and, thus, this creates a positive online store reputation. the correct order_id parameter is selected automatically. By your request, we can integrate any SMS service for you for an additional $100. 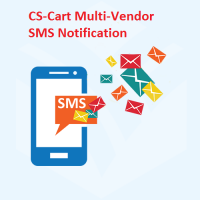 The Multi-Vendor SMS notification add-on is compatible with CS-Cart Multi-Vendor 4.x. This add-on will be delivered to you during one-two business days from the moment of purchase. 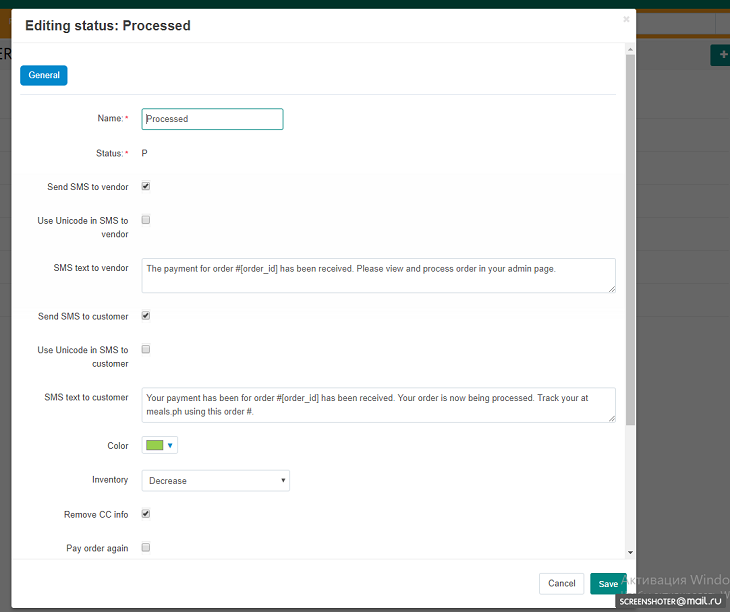 As soon as you installed the add-on Multi-Vendor SMS notifications, you need to set it up. Go to the Add-ons -> Manage Add-ons. Find the add-on in the list of others installed add-ons. API Settings means that you should enter your data in these fields. Apikey - enter your own Apikey that you get from Semaphore Provider. Signature - SEMAPHORE (the name of SMS service). Main administrator ID - enter User ID. This user will see all errors if it happens. Enable main administrator SMS notification - tick the field if the admin should get the messages about status change. Use Unicode in SMS to administrator - tick the field to use Unicode standard of encoding. SMS text to administrator - write down the text you want to see in the administrator SMS. 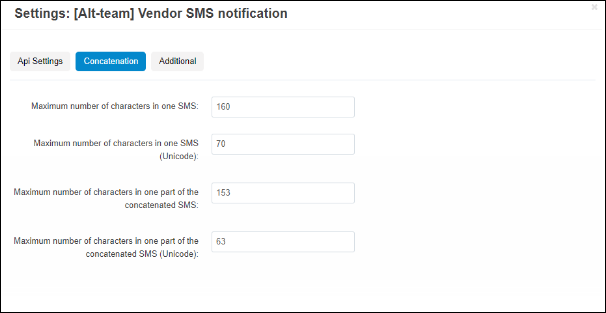 Disable all SMS notifications for all vendors - tick this field in case you don't want vendors to get SMS-notifications. 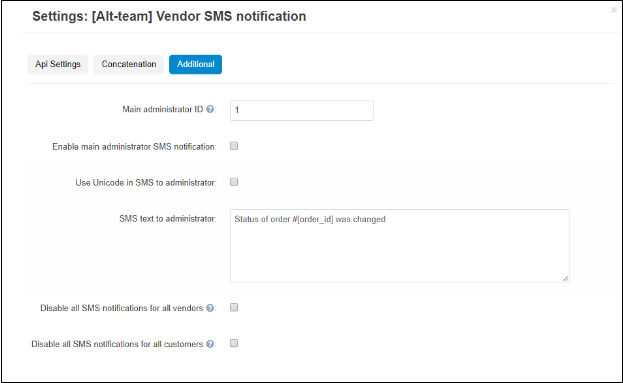 Disable all SMS notifications for all customers - tick this field in case you don't want vendors to get SMS-notifications. When the work with the main settings are done, the store administrator should go to editing vendor page and make some changes there. Look at the screenshot below. Find the field Send SMS and tick it. Save the page. Then go to Editing Status page in the admin panel. Fill in these fields and save. Download the archive with the Multi-Vendor SMS notifications add-on for CS-Cart version you use. 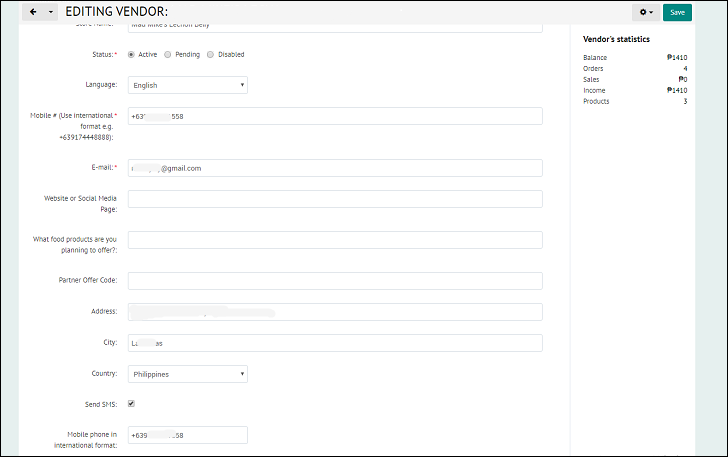 Log into the administration panel of your store, go to the Administration -> Add-ons. In the list of add-ons find the Multi-Vendor SMS notification add-on and click Install opposite to its name.